12.00pm - visited my grandparents (which means Baby Iqbal's atok boy and atok girl) in Kota Batu. He was mostly asleep while we were there. 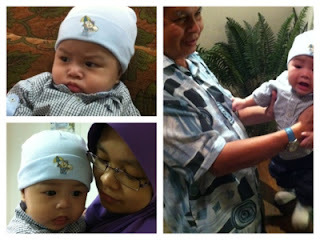 Atok girl got to hold him only for a while, she has been asking for Iqbal's visit since we last met her. Atoks will be going for their Umrah on this 1st May. 1.45pm - jalan-jalan di Hua Ho Manggis. 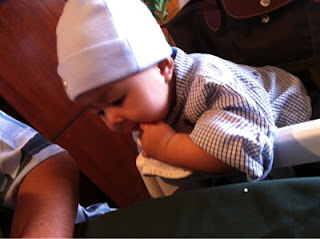 I was gna get him a teether but seems like nothing caught his eyes. He refused to hold all the teethers (actually all the things he saw pun he doesnt want to hold). 2.30pm - Baby Iq was already grumpy and fussy. We knew it was time to go home but we had to stopped by at a bakery for awhile. In the car, Baby Iq was screaming and crying already, even refused to be nursed. Huhu.. I guess he was really tired already. We came back home, he was fast asleep after Dad rocked him. Poor Baby! 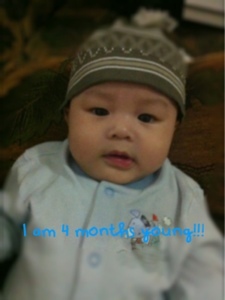 I do hope he had fun seeing the world :D Happy 4 months young, Dearest Son! Mama and Ayah pray that you will always be happy here with us. Semoga mendapat segala kebaikkan di dunia dan di akhirat. Amin ya Rabbal alamin.. We love you Baby Iqbal ❤!! !